The President of Libya Jumhurriya, Muammar al-Qaddafi, recently sent a message to Barack Obama, calling him ‘son'(!! ): “As you know too well democracy and building of civil society cannot be achieved by means of missiles and aircraft, or by backing armed member of Al-Qaeda in Benghazi”. The Al-Qaeda Qaddafi is talking about was created by the French, the US, British and Israeli intelligence service in 2010. The reason, former Mossad mole, French President Sarkozy was first to bomb Libya in support of the anti-Qaddafi alliance, the ‘Popular Front for the Liberation of Libya’ – because the front had cut a deal with Paris to give 35% of Libyan oil reserves to French companies. 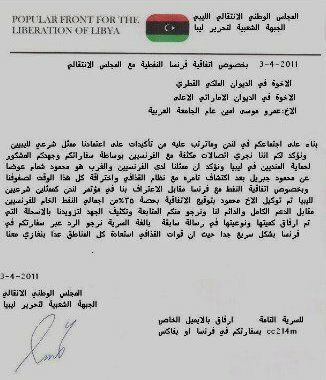 See the letter on top left, sent to to the embassies of Qatar and UAE in France on April 3, 2011. As Stephen Lendman wrote in March 2011: “This one’s for regime change like others, to replace one despot with another, control the entire Mediterranean Basin, colonize Libya, perhaps balkanize it, control its oil, gas and other strategic resources, exploit its people, privatize state industries, and establish new US bases for greater regional control”. Despite three weeks of carpet-bombing, huge investments in ‘people opposition movement’, disinformation campaign and eventual direct foreign intervention in Libya, the ‘anti-Gaddafi project’ has come to obvious deadlock. Interestingly, the very states which are killing and terrorizing Libya’s population under the smoke-screen of “humanitarian bombardment” – have now become paranoid with the possible ‘terrorist blowback’ sponsored by Col. Qaddafi. I am sure, Sarkozy’s close relations with Israeli Mossad – it would not be difficult to pull another Lockerbie false flag operation, blaming Qaddafi, to provide an excuse for the NATO forces to begin invasion of Libya by land – thus turning another Muslim country into devastated Iraq and Afghanistan. Dr. Edward Lozansky, the Ukraine-born Russian nuclear physicist (now a US citizen), believes the trigger-happy Obama should not arm the anti-Qaddafi groups because western intelligence agencies are not sure who they really are(Islamists, etc.). There is possibility that after the fall of Qaddafi, they might turn their guns on the US, as Taliban did in the past. “American military doctrine states that the country can handle only two simultaneous wars at a time. Now we have three wars plus close to 15 trillion dollars national debt. God, save America,” wrote Edward Lozansky. NATO’s only Muslim member, Turkey, has floated a roadmap to salvage something out of Sarkozy’s failed Qaddafi Project.